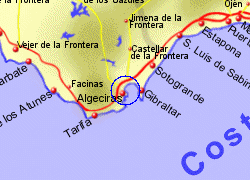 Map of the Algeciras Ferry Port area. The busy port of Algeciras is the main departure point for ferry routes to Morocco, located at the industrial town of Algeciras - this is not a tourist spot. 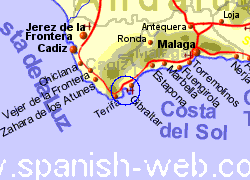 The A7 motorway connects Algeceras along the Costa del Sol to Malaga and beyond, the 140Km journey taking a little over an hour and a half by car. 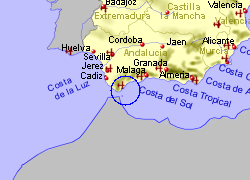 Meanwhile, the border with Gibraltar is about 25 minutes or 20Km. 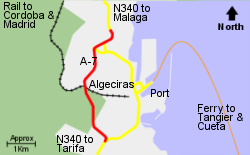 There are several bus routes connecting Algeciras with the rest of Spain. The main train station, where there are fast (not high speed) Altaria and slower regional trains, is 300m from the ferry port. The Altaria train takes approximately 5 1/2 hrs from Madrid. Also operated by Acciona with up to 34 crossings per week, crossing time approximately 1 hr. Also operated by FRS with up to 11 crossings per day, crossing time 1hr 30 mins. Also operated by Intershipping with up to 3 crossings per day, crossing time 1hr 30mins. Also operated by FRS with up to 5 crossings per day, crossing time 1hr. Also operated by Balearia with up to 10 crossings per day, crossing time 1hr 15 mins.